Home | Vinyl Siding Cost | Have you calculated your long term siding cost? As you watch your neighbors convert their homes over to vinyl siding, you may feel pretty good about your own situation. After all, your wood siding is still in decent shape and other than some repairs from time to time, it only needs a fresh coat of paint every few years. What do your neighbors know that you don't? Have you ever sat down to calculate your long-term siding cost? What's your real siding cost? How often does wood siding need to be painted? There really isn't a good answer as it can depend on your climate, the paint used, and even the type of siding on the home. However, there's a good chance that to keep it looking good, the home may require new paint every 6-8 years. The R.S. Means Repair and Remodeling Cost Data guide estimates that to put a coat of primer and two coats of exterior latex paint on wood siding is about $1.74 per square foot. That price does not include any excessive sanding, scraping, or prep work and can vary by region. If your house happens to have about 4,000 square feet of siding, that adds up to about $6,000 each time you paint. How long do you plan to be in your home? If you're moving next year it may not be an issue, but another 20 years could add about $18,000 in potential exterior paint costs. Don't forget about repairs when figuring your total. As the wood ages, sections may need to be replaced and could cost several hundred dollars every time a contractor makes a visit. You might be adding $500 a year or $10,000 to that $18,000 total cost. The R.S. 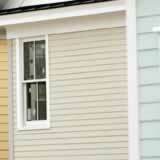 Means guide estimates that heavy .048 gauge vinyl siding may cost about $3.30 a square foot to be installed on a house. If your neighbors' homes are about the same size as yours, their vinyl siding may be costing them about $13,200 and shouldn't need any expensive maintenance for well over 20 years. There may be a very good reason why they're converting to vinyl siding.